One thing about traveling in China: You never really understand the reason behind half the things that are going on. For example, 7:30 am every morning is bird time. As I walk by the tiny park near our hotel, there are birdcages full of tiny brightly colored birds hanging from the trees or being carried by old men. At any other time of day they are gone. Is it a bird enthusiasts club? Do the gentlemen simply like to chat to birdsong for half an hour every morning? I guess I will never know, but whatever the reason behind it I enjoy bird time even more than 7or 8 pm when the place becomes a temporary dog park. Sometimes I want to sit in the park all day and see if people bring their pet turtles to socialize too, but I have the mysteries of the human body to get to so I sigh and hurry on. Clinic continues to go well, with the usual hassles trying to get there on time. Today I got to insert one of the wrist zone acupuncture needles for our patient.Yes it is supposed to be bent like that, to keep the needle out of the way. It is so superficial that the patient can move her wrist without pain. Up until now Dr. Qiao has been doing that since it is one of her specialties. I really enjoyed it since it was a new technique to me and the patient said it was not painful at all. Many of our patients’ chief complaints had changed today, which is a sign that they are doing well. We had a few interesting discussions with Dr. Qiao and she told us about her approach to acupuncture for Multiple Sclerosis. This is a particular topic of interest for me as I presented my paper on Chinese Medicine in the Treatment of Multiple Sclerosis at a conference last year. In Dr. Qiao’s opinion, MS is best treated with back “shu” points which nourish the five major organ systems and points on the Ren channel on the front of the body which are the most effective for the immune system’s as the immune system is Yin and Qi deficient in MS. On the scalp, she recommended the balance region, motor sensory region of the foot area, BL9 and 10 and Si Shen Cong, all angled posteriorly. This all goes nicely with my previous research, although I feel the Hua Tuo Jia Ji Points can also be very important for certain patients. We had lunch at a sit down place at Fu Zi Miao (the Confucian temple complex) today. My favorite dish was pumpkin with fresh lily bulb, but the spicy fish soup was pretty good too. I am worried I will go home with a taste for things like fresh lily bulb and then not be able to find them in the U.S. Lilly bulb is actually used in food therapy to nourish the lungs and calm the mind in Chinese medicine. Was it Hippocrates that said “Let your food be your medicine and your medicine your food”? He would approve of the Chinese diet I think. Speaking of diets though I think I’ve lost some weight. Maybe I can promote it when I get home. I’ll call it the new China diet and get rich off of it by writing a book. Basically the rules for my diet are simple: 1. You can only eat foods you have never had before that are labeled in a foreign language you cannot read or speak. 2. If you go out with people who can read or speak the language you must eat in a group of at least 10 people all fighting for the same dishes on a lazy susan. 4. If you eat meat, no meat that has already been de-boned, just hacked up entire animals in various mystery sauces. 3. You can only drink hot tea, no matter what the weather is like. There it is. New China diet. Tell your friends. In the afternoon we actually had a lull in our patient load (a minor miracle since Dr. Qiao is so well respected). Because we didn’t have a patient she told us stories about the barefoot doctors during the Chinese Cultural Revolution. This fascinated me so here is a brief summary of the program as I understood it. Basically during the 1960s Mao and the Communist party realized that the medical system in China was not serving the needs of the rural population at the time. The barefoot doctors were individuals chosen by their local villages and trained in basic preventative and simple health care by doctors who had been sent to the countryside to do so. The doctors mainly came from the cities and some were bitter to be sent away from their universities, families and hospitals to such rural settings. However, the “rural cooperative medical systems” eventually provided healthcare to 90% of the rural villages, so in terms of making healthcare accessible this was an amazing achievement. The techniques the barefoot doctors learned were a combination of Western and Chinese medicine, and included acupuncture and moxabustion as well as how to administer immunizations and improve sanitation. 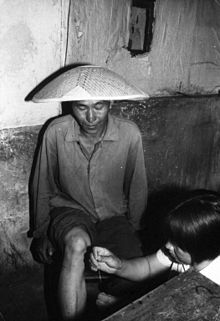 I did not take this picture, it is courtesy of Wikipedia, who has a nice article on the barefoot doctors. Because the doctors only had a few months to train the barefoot doctors, their education was limited. In terms of acupuncture they learned 4 points. St36 was prescribed to treat all internal pain, Li4 to treat anything affecting the head and face, Lu7 for all respiratory and neck or shoulder complaints and Bl40 to treat the back. These are really the “big dogs” in terms of acupuncture points, but I’m glad that I was fortunate enough to learn the hundreds of points that exist. The beauty of Chinese medicine is that it can be so personalized after all. I think that treating with those four points would work often enough to be useful, but you can get much more value out of a treatment that uses all the wisdom accumulated during the thousands of years that acupuncture has been refined.